The new diesel equipment on display at CONEXPO heralds a new age for off-road equipment. This new age is one that will be marked with environmental sensitivity, but without sacrificing a machine’s ability to do its work. In fact, the new machines will be the most fuel efficient ever put out in the field. As America goes to work rebuilding its infrastructure, the diesel equipment that will be doing it represents a pinnacle of performance on all fronts. The diesel off-road machines you see by the side of the road may seem the same as the ones you’ve seen for decades, but changes have taken place under the skin that have turned them into completely new workhorses. At the recent CONEXPO-CON/AGG conference in Las Vegas the newest of the new were on display, demonstrating the “new day” for off-road machines. With President Trump and others talking seriously about the need for big investments to repair and upgrade America’s infrastructure, CONEXPO showed how industry is ready to do those tasks with more efficiency than ever. The hardware on display put an emphasis on improved productivity through advanced technology and new software tools designed to maximize the quantity and quality of work that could be performed. Examples of new technology abounded at CONEXPO. The vibe at the show was that industry has spent the past three years dreaming up new ways to take construction and other off-road industries to new levels. Here’s a run-down of some of the highlights from DTF members. Case Construction Equipment had a big presence at CONEXPO, unveiling new products and technologies, but also including a series of 15 sessions in its “What’s Now” series that covered topics ranging from workforce development and retention to Case’s new C Series mini excavator. Highlights of the show for Case including the unveiling of Project Minotaur, its new compact dozer; a Case history wall video celebrating its 175th anniversary; and its involvement in Project AME, the world’s first 3D-printed excavator. Caterpillar equipment was on display both inside CONEXPO’s exhibit halls and on outside lots where they could show off some of their chops. CAT brought 40 machines to fill 60,000 square feet of exhibit space in the two areas. Eight CAT machines made their public debut at the show and a half dozen more were recent introductions. The new machines were augmented by new remote control and connectivity technologies. Cummins displayed its variety of engines and services at CONEXPO, including Tier 4 Final engines, Stage V engines, turbocharging, filtration, fuel systems, electronic controls and exhaust aftertreatment systems. The company also featured Cummins Connected Solutions, which uses remote engine monitoring to reduce unplanned maintenance and keep equipment operating at optimum levels. Ford Commercial Vehicles had a variety of its truck offerings on the floor of CONEXPO, demonstrating the variety of upfitting options available for light, medium and heavy-duty applications (classes 1-7). FPT Industrial presented a new 20-liter engines at CONEXPO along with Tier 4 Final engines designed for use in heavy-duty off-road applications, including the Cursor 16 and N67. All of these engines have moved to common rail injection systems to increase efficiency and reliability. Isuzu Motors America featured its RED Tech (Reliable-Eco-friendly-Durable-Technologically Advanced) Tier 4 engine lineup that stretches from .99 to 15.7 liters and can deliver more than 500 horsepower. John Deere Construction brought 38 machines to CONEXPO, but also had 11 simulators that allowed potential customers to “test drive” out a variety of equipment. At the show John Deere announced it would help contractors increase uptime with a Big Parts Promise, guaranteeing that critical parts would be available in as little as two hours. John Deere also was represented at CONEXPO with its Power Systems & Electronic Solutions divisions, where a new 13.6-liter engine was introduced. MTU showcased its lineup of Tier 4 engines that pioneer solutions to different emissions stages while offering the lowest fuel consumption in their power range. While the company had its engines on display in their booth, their engines were featured in a variety of equipment throughout the show. 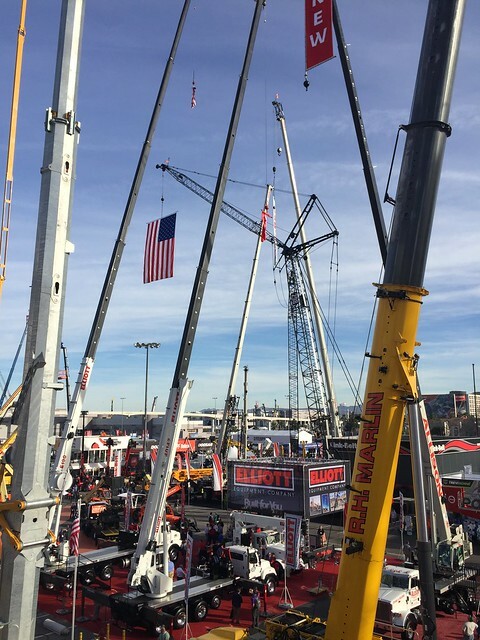 Volvo Construction Equipment and Volvo Penta occupied a large booth and were joined at the show by Volvo’s other brand - Mack Trucks. Volvo’s theme was “Push Boundaries” and they displayed the vehicles and technology to do its ranging from the world’s largest articulated hauler to the new L350H wheel loader to prototype electric autonomous haulers that may be on job sites soon. Bosch Rexroth showcased new systems, products and technology designed to improve machineries’ efficiency, reliability and performance. The Bosch display showed its hydraulics, electric drives and controls, gear technology and linear motion and assembly technology that are found in many of the machines on display at CONEXPO. The new diesel equipment on display at CONEXPO heralds a new age for off-road equipment. This new age is one that will be marked with environmental sensitively, but without sacrificing a machine’s ability to do its work. In fact, the new machines will be the most fuel efficient ever put out in the field. As America goes to work rebuilding its infrastructure, the diesel equipment that will be doing it represents a pinnacle of performance on all fronts.